Keeping your industrial air compressor in top form is essential to the maintenance and operation of your compressor. Anything performing below its optimal level can surely prevent you and your workers from doing their job well. To ensure that your industrial air compressor is reaching its full potential in terms of performance, follow these tips! 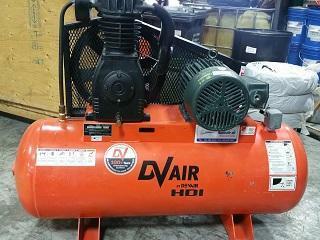 These tips will keep your industrial air compressor always running at its best! First of all, this depends on whether or not your industrial air compressor even runs on oil! However, just because your machine doesn’t run on oil, that doesn’t mean you shouldn’t inspect it anyway! Changing your compressor’s oil or simply making sure that your industrial air compressor is working as intended is obviously vital to the overall maintenance of your compressor! If your air filters are loaded with dust and dirt, change them! Air filters are aptly named so that they may filter air! A large buildup of dirt on your air filter usually leads to your industrial air compressor letting dirt in, what is the exact opposite of what it should do! Make sure you clean your air filter regularly to avoid a filthy filter! Changing the oil and maintaining the filter once isn’t going to do much for your industrial air compressor. Sure, it’ll at least last a little bit longer than if you hadn’t done those things, but regular maintenance checks will continue to keep your industrial air compressor running at its best. We at Reap Air Compressor Services are one of the most reputed distributors of industrial air compressors on the market today. We not only distribute compressor units, but we also provide compressor parts throughout all of Southern Ontario. So if your industrial air compressor seems to be underperforming, contact us today for a repair or even an upgrade should you need one!